My Mobil Phone is 707 357-7797 call or text. If you prefer you can email me directly. “Craig likes to refer to his pieces as "Mother Nature’s work," I just polish it up”. When you see the finished product would have to agree that Craig makes a great partner with Mother Nature with his finished pieces. Most exceptional are his skills in finishing, which retain the natural shapes of the wood, while enhancing the unique beauty and grain of each piece. In 1976 a friend in Albion showed me the first slab redwood burl. Century logging. I get salvaged wood from logging, the beaches and rivers. Together with many friends and partners over the years, I have cut and wholesaled raw wood to woodworkers from up north and the San Francisco Bay area. In 1984 I started working with one of my wholesale slab buyers and began learning how to create a range of beautifully designed and finished tables, desks, benches and outdoor furnishings. In addition to Redwood burl, I’ve used Black Walnut, Madrone, Maple, Manzanita, Douglas Fir, Cypress, and a very rare Nutmeg. In 1999, I started my website www.mendocinoredwoodburl.com with help from my father, Chuck, who at the time was Mendocino Graphics. 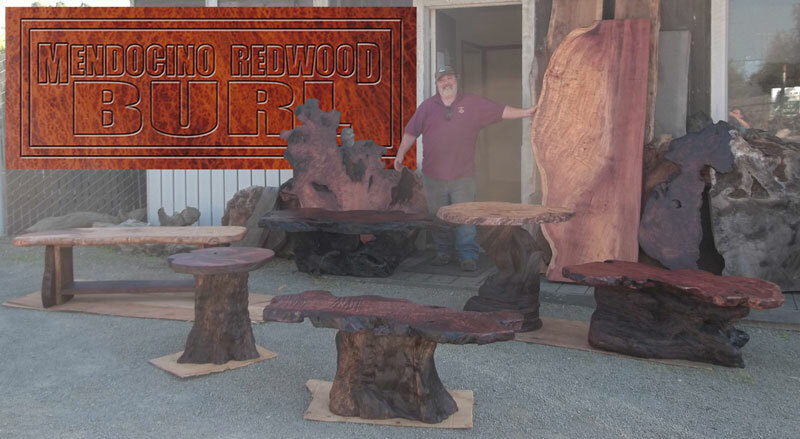 I focused working full time crafting redwood burl tables and furniture, working out of Sea View Gallery south of Fort Bragg. Selling furniture locally and to internet buyers from all over the country, and building unique, custom made orders. In 2003 I joined the Elk Studio Gallery and then 2 years later kept going as The Artists Collective in Elk with my partners Jim and Lu Vickery. The gallery has flourished and done well in the little town of Elk ever since. All of our pieces are made from recycled and lawfully obtained and supplied wood. I have been collecting previously fallen and dug up root balls in the Mendocino area for more than 30 years. I am what is commonly referred to as a "Wood Hog" because of my amazing scrounging abilities.